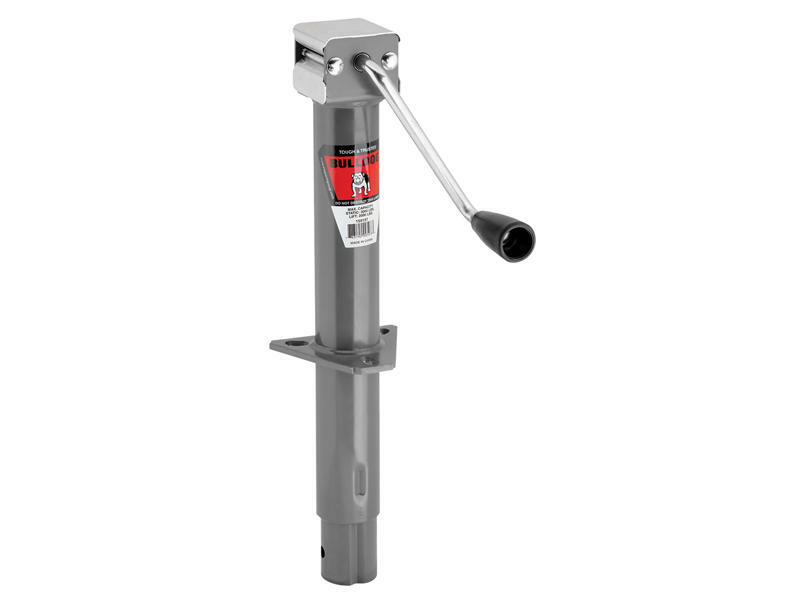 This item is a Sidewind, Bulldog Tongue Jack with a Corrosion Resistant Black Powder Paint. It is Ideal for RV and Travel Trailer Applications. 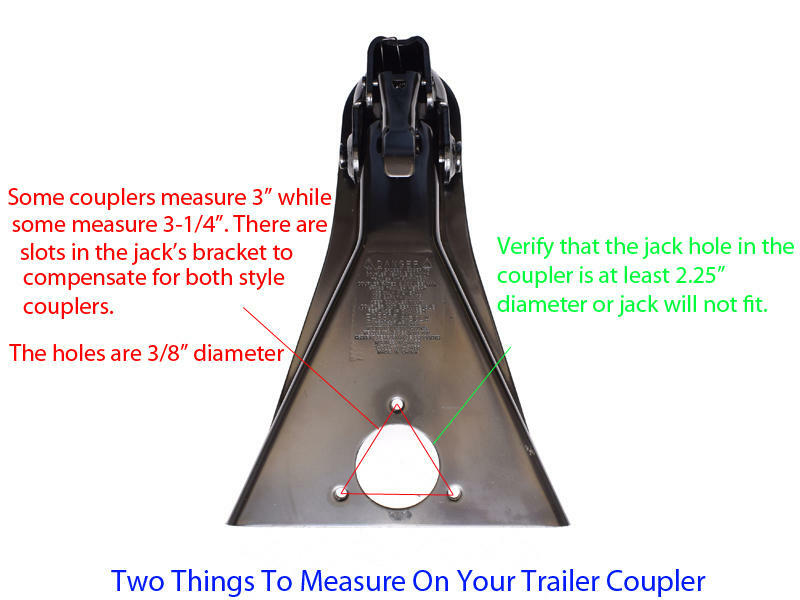 This A-Frame Jack has a Front-Facing Sidewind Crank with a High Quality Gear Train. There is also a Removable Caster or Foot Plate Available. 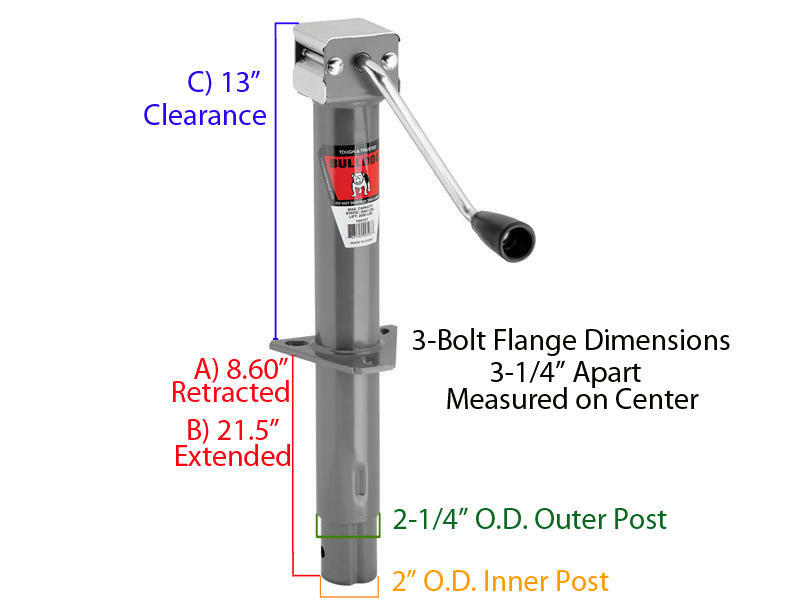 The High Strength Mounting Bracket Provides Easy Bolt-On or Weld-On Installation. 1919 - In a small third floor room over his car dealership in Wausau, Wisconsin, Thomas J. Jacob begins making high-quality precision tools of his own design. His venture becomes known as the Hammer Blow Tool Company. The death of a favorite hunting dog due to an accident involving a poorly-designed trailer hitch leads Jacob to develop the first drop-forged ball-and-socket trailer hitch, which he names the "Never Lets Go" Bull Dog. More inventions follow, positioning Hammer Blow at the forefront of the trailer industry at its infancy. 1930's - Demonstration models of camper trailers built by Jacob at the Chicago World's Fair set off a period of rapid growth in the industry. 1940's - Jacob dies in 1945. His wife, Lula, takes over Hammer Blow and guides it with great success for more than 20 years. 1960's - In 1967, Lula Jacob sells Hammer Blow to Neway Equipment Company of Muskegon, Michigan, which later sells to Lear Siegler, Inc.
1970's - In 1977, private investors led by Thomas J. Reinhart purchase and rename The HammerBlow Corporation. Expansion of the mechanical jack line and related products continues for more than a decade.